Welcome to the George W,. Bush Library. The George W. Bush Presidential Library and Museum has been high on my to do list – ever since it opened, but I’ve been kinda of busy. With all of my Christmas shopping done, the Sunday before Christmas turned out to be a perfect time to visit. Well almost perfect. It was COLD last Sunday. I bundled up, but I had on a skirt and heels from church. A pair of pantyhose was the only thing protecting my legs from the arctic air. BRRRRRR. We did get to park right across the street from the library, but I was still pretty frosty. And then there was the line. Don’t get me wrong, I’m thrilled to death Dallas has an attraction like Dubya’s library, but I thought everyone would be out shopping. Not so! Once past security, purchasing tickets was a snap. I’d downloaded the library app to my smartphone, so I passed up the audio tour. Come to find out, that was a mistake. I never got the phone to tell me anything. Perhaps I needed earphones. I’ll do some research before I visit again. I was not very well prepared this time. Truth be told, however, I don’t know what I would have done with more information. I’m just not ready for this millennium. I live in a constant state of information overload. Sitting at home watching an episode of Dancing with the Stars is challenging, because so many tidbits flash in my face. I have a hard time deciding whether it’s a twitter post or an advertisement. There are so many feeds squeezed on the screen that I can’t figure out what’s up. That’s how I felt at the Library. Waiting to enter the library, there’s a cool video presentation. All kinds of people and places are presented in an inventive way. I recognized some of the people and scenes, but others left me wondering what exactly they had to do with the 43rd president. Then we gained access to the permanent exhibits on the north side of the museum. Just inside the entrance, snippets of George W. Bush’s life are presented in multi-media. I was engrossed, trying to take it all in, but Mr. Bill was antsy. He’d already had to wait in too many lines and he didn’t want to miss the five minute film that was about to begin. I wasn’t ready, but I like being married, so we know what I did. After the film, I returned to where I’d been, but I’d lost my front row vantage point and no one was going to let me in. I gave up, because I’ll be back, and headed into the “No Child Left Behind” section. This is the heartbeat of the Bush family. Before the day was over, I heard them mention their devotion to education a number of times. This particular area is very kid friendly, with a kid-sized benches inside a faux school bus and a cozy reading nook. I love the idea of No Child Left Behind, but I can’t say that I’m enamored with the application of the initiative and there were no kids with me, so we moved on. Next was the 9/11 section, beginning with bent girders from the Twin Towers. Poignant memories of that day still haunt me, but this is where I figured out that I wasn’t going to be able to take it all in on this first visit. Every wall in the place, from somewhere about my knees to far above my head, is plastered with information and it comes in a variety of formats. Some of its video, other is print, still more is artifacts. In addition, just about kid level, are all kinds of hands-on things to do. Kinetic is not my primary learning mode, but I appreciated that they really did have something for everyone. There’s the obligatory Oval Office, several of Laura’s dresses and many of the things you’re used to seeing in a presidential museum. (You’ll notice I said “Laura.” That’s how the staff refers to them, “George and Laura.” It made me feel very cozy with the Bushes.) I always enjoy these personal touches and get a kick out of seeing tables set for formal dinners. What I love best is the international stuff. I could have spent a day just on the memorabilia and photographs from their hosting and visiting of international people and places. Sort of center stage is an area called Decision Point – like his book. It’s sort of an interactive game you play with a room full of people. Each member of the audience sits at a screen and then a video at the front of the room leads you through one of the issues in Bush’s presidency. First everyone votes on what subject they want to consider and my group chose Iraq and the weapons of mass destruction. That had not been my vote. Therein lies the problem with a simple majority. The concept is good, but I didn’t feel as if enough time had passed for it to really be meaningful. In a couple of decades, this game may leave the biggest impact on visitors, but for me, it was merely a reiteration of things I already knew. After all, not only did I live through it just a few years ago, my husband served as an interpreter in Iraq and I’ve read Mr. Bush’s book. If you have been or visit someday, tell me what you think. Video is a big part of the museum. Several short films allow George, Laura and the family to tell their own story in their own words. One video is narrated by the twins. It highlights Camp David and Prairie Chapel Ranch. The final video is George and Laura, sharing their visions for the future and thanking you for taking the time to come to the library. Laura’s a big part of the museum, too, but not oppressively so. I call the presidential museum in Simi Valley, the Nancy Reagan Library, for reasons that are immediately obvious when you visit it. We took a little break before we saw the rest of the museum. There are two food outlets. One is Cafe 43. Next time, I’m going to include it on my agenda, but we’d already had lunch when we arrived. So we found the snack bar, a small food spot just off the central patio. We shared a delicious yogurt parfait, but they have everything from soda to sandwiches. I can imagine on a warmer day it would be pleasant to linger on the patio soaking in the Texas sun. Instead we huddled together next to the counter because there are no tables inside and shivered every time someone entered the room. Finally we entered the temporary galleries and Christmas Tree, oh Christmas Tree! The special exhibition area was given over to the 2001 White House Christmas theme of Home for the Holidays. If you are a lover of Christmas, like me, hurry over there now, because this exhibit ends on January 5th. The tree was well worth the price of admission, all by itself and we’d already enjoyed so much. But there’s more. They had scale models of different presidents’ homes and I enjoyed comparing those I’d seen with those I haven’t visited – yet. I confess, I didn’t even know they had a Christmas related-exhibit at the museum, but now I’ve subscribed to their blog, so I shouldn’t be missing anything else. You shouldn’t miss anything either. This is a must-see, wherever you are, but if you live in Texas you have no excuse. Get yourself to the George W. Bush Presidential Library and Museum! Oh yeah – and Happy New Year! “As you approach the entrance, you see before you a long drive lined with ancient trees of old. Birds fly in and out of the Red Cedars singing their tunes as a quiet alarm of an approaching visitor. Warm summer breezes sweep through the trees as the sun shines down on the fields in the distance. Just ahead you see the gate posts worn from time that have stood as sentinels against those who would come to disturb the peace of this plantation. Your sight takes in the carpet of green grass of the bowling green that leads you up to the grand old mansion. Trees that have stood before the time of this plantation still stand guard over it, witnesses of the history that passed just below their out stretched arms. The laughter of children, the tears of families and haunting silence of years of lonely abandon echoes in their branches as the wind whispers through their leaves. Over head you hear the call of a majestic eagle as he sweeps through the high currents of the clear blue sky as clouds drift back as if only to admire the beauty this land has to offer. As you step out into the sun light, peace seems to pull you in close, cradling you in its loving arms. This sight is just a taste of what lays within the border of our beautiful state of Virginia. With first permanent colony settled was settled in Jamestown in 1607, Virginia has witness the birth of a nation from the very start. As our great country grew, so did the homes and plantations of Virginia. The Plantations and Historic Homes of Virginia are among the oldest homes in America. They have witnessed more than four centuries of American history. 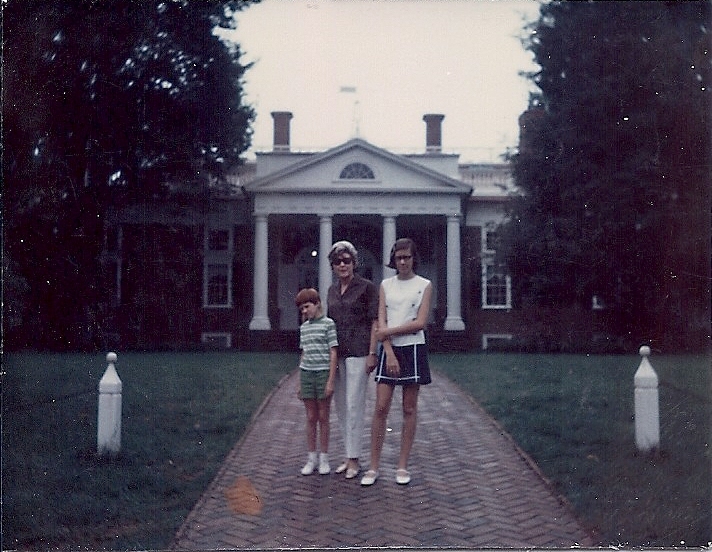 From these grand homes and plantation, many influential people have called Virginia home. Known as the “Mother of Presidents” eight American Presidents have called Virginia home. In 2012, the Governor of Virginia, Bob McDowell, declared the year 2013 the “Year of the Virginia Historic Homes”. This celebration coincides with the 200th birthday of the Virginia Executive Mansion. Just like the Virginia Executive Mansion, Virginia’s Plantation and Historic Homes have been part of a rich history. 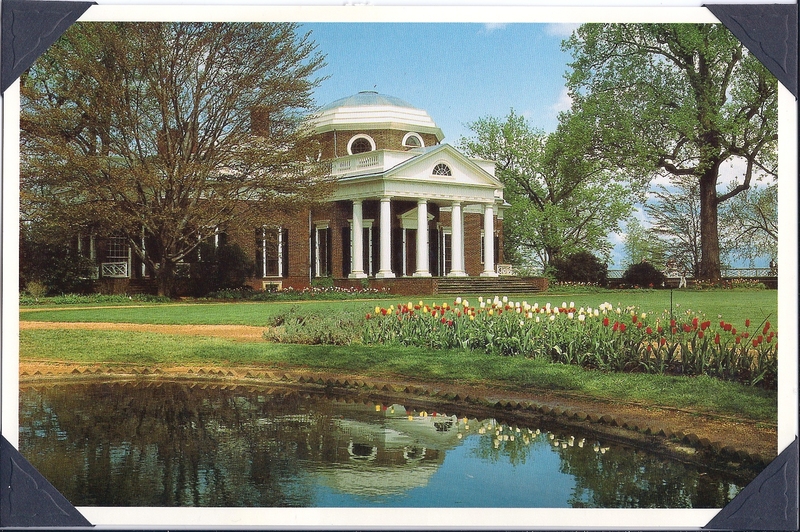 Homes such as Monticello, Mount Vernon and Montpelier are very well known and often visited locations in Virginia. But do you know places such as Westover, Berry Hill, Bacon’s Castle or Kenmore? With several hundred locations in almost every region of Virginia, you can’t turn without being within a few miles of one of these hidden gems. While the above description brings thoughts of “Gone with the Wind”, this location unlike Tara does exist here in Virginia. Located just south of Fredericksburg, sitting on a bluff overlooking the Rappahannock River, stands a Plantation Mansion called Belle Grove. Belle Grove Plantation was established in 1670 and was the held by the Conway Family for 120 years. From this family came a young girl who would met and marry a plantation owner from Orange County. It was here that she would return to give birth to the 4th American President and Father of the Constitution, James Madison. Just minutes from his childhood home, Lawrence Washington, Great Grandfather of George Washington would play on this plantation as a child and George would be a frequent visitor in later years. The Mansion that currently stands was built in 1791 and expanded in 1839. It is believed that the basement is the foundation of a previous home of the Conway family and possibly the home where James Madison was born. Belle Grove has seen every American War, but the Civil War would come the closest. With the battle line drawn down the river of the Rappahannock, Belle Grove is believed to have serviced as a Union Headquarters towards the end of the war. After the assassination of President Lincoln, Belle Grove would once again play a part in history. John Wilkes Booth with his companion, David Harold would use the ferry location now found on this plantation to cross the Rappahannock River. They would later end up just three miles away at Garrett’s Farm. The Union Soldiers pursuing them would stop at Belle Grove to rest with one of the soldiers, Lt. Everton Congar, sleeping in the front hallway. Now, opening to the public for the first time in its long history, Belle Grove Plantation of Port Conway, Virginia will open its doors May 2013 as historic Bed and Breakfast. Come surround yourself with the history of America while enjoying the peace of a Southern Plantation! Welcome to my series on Presidential Destinations. The series was supposed to stop with Number 14, Mount Vernon, but even though I live in Dallas, I forgot that it actually has a presidential destination. If you read Number 15, you know that I’m not fond of Dallas’ association with Kennedy’s assassination, but there will soon be a presidential destination here that I’ll be proud to take visitors to: The George W. Bush Presidential Library and Museum. I know GWB’s name is a lightning rod. People either love him or they hate him. Here’s your warning: I’m on the loving team. I’ll readily admit that, like most human beings, he made mistakes, but I think history will be a lot kinder to him than our modern day talking heads have been. He’ll be the guy that carried us through the aftermath of 9/11, focused on critical National Security issues and, if our sense of fairness ever returns, his policies will be credited for the capture of Bin Laden. Many people see him from a completely different point of view. I acknowledge that and respect it, but this is my blog. I’m a fan of GWB, but not exactly a groupie. I remember the excitement created when Laura picked out the Preston Hollow estate for their Dallas home and I was aware that SMU would be the site of his library, but I was in the middle of completing my degree when all the fuss was going on and I really didn’t pay much attention to it. When you offset your mid-life crisis by returning to school, your brain doesn’t have much room for anything else, but the local papers and evening news were full of it. I still haven’t driven by their home, but I’m very familiar with the site of the library, thanks to my mom’s CPA. He’s one of those liberals. He knows I’m a conservative, but he baits me with liberal propaganda the whole time he’s preparing my parents’ return. Without the political commentary, it would only take about fifteen minutes for him to plug in the few numbers necessary to complete my parents’ tax return, but we never get out of there in less than an hour. A few years ago, in an effort to avoid the usual liberal harangue, I glanced out of his high rise office onto a baseball diamond across the highway. “What a great view,” I said, thinking I’d hit upon a neutral subject – WRONG! I wasn’t aware that the baseball diamond would soon be a building site for GWB’s library. It was like Pavlov’s Dogs. The subject of George W. Bush came up and the liberal in the room started salivating. If you’re a fan of our forty-third president, you may already be planning a visit to Dallas next year, so you can see the largest presidential library and museum built to date. If you aren’t a fan, maybe you should plan a visit so you’ll have a chance to hear the other side of the story. One thing I know for sure, once the library opens my mom’s accountant will have plenty to bend my ear with. Welcome to the fifteenth installment of Primarily Presidential Destinations. We’ve covered almost all of the Presidential destinations that I’ve visited, but we haven’t talked about Dallas. I live in Dallas now, but my family lived in Georgia when Kennedy was shot in Dealey Plaza. Like most Dallasites I try to disassociate my city from the assassination, but we can’t quite shake it. Love Field no longer looks anything like it did when the dazzling Kennedys stepped onto the tarmac. When I think of Love Field, my mind is more likely to run to hot pants by Pucci than a First Lady in a pink suit. Sure I remember the black and white photos, but Braniff landed there a lot more times than Airforce One. I never greeted a president at Love Field, but I welcomed the Dallas Cowboys outside the Braniff terminal after many an away game- whether we had won or lost. If you live here, visitors are going to ask about Dealey Plaza, the Texas School Book Depository and Parkland Hospital, but I always discourage them. From Dealy Plaza you can gaze at the infamous grassy knoll, but you can’t drive the route JFK did, because traffic in front of the old courthouse flows one way in the wrong direction. You can find Parkland Hospital, but you’d never find anything in the huge complex, remodeled several times over, that even remotely reminded you of the hospital in those old news clips. There’s an old building across from Dealey Plaza that was the Texas School Book Depository. It’s been through several incarnations, but the infamous window is still there. Inside there’s something called The Sixth Floor Museum. Some guy bought up some of the contents of the Depository and several people went broke trying to make money off of them. Apparently the current manifestation of the museum is the most successful, but it’s a good thing they have tourists to depend on, because even Dallas school teachers don’t want to take their students. A block or so away from Dealey Plaza is a big square piece of concrete that is a memorial to the assassinated president. It embarrasses me a little bit. If a guest does insist that they must see where Kennedy was shot, I will drive them by Dealey Plaza and the Book Depository, but I never allow enough time to see the Sixth Floor Museum and I never point out the memorial. It looks like an abandoned building project – blank walls and no ceiling. If we were going to have a memorial to him, it should have looked more like Dealey Plaza – columns, a statue, lots of grass. Maybe a waterfall or something, but not the empty concrete walls on a slab of concrete behind a red brick courthouse. There’s so much more to see and do in Dallas. Dallas didn’t kill John F. Kennedy. Maybe it was Lee Harvey Oswald. Maybe it was the Mafia. Maybe it was aliens. But it wasn’t Dallas. For that matter, we didn’t shoot JR either, but I’ll save that for another day. Come to Dallas to shop. Redecorate your digs in the Design District. Eat at our restaurants. See the Dallas Museum of Art, The Meadows Museum, The Crow Collection of Asian Art, The Nasher or any number of museums besides the Sixth Floor. Catch an opera, symphony or show in the Arts District. There a lot to do, but don’t waste time on an event we’re working so hard to ignore. Welcome to the final stop in our series about travel destinations related to American presidents. Now we’ll visit George Washington’s Mount Vernon. It’s an amazing place to visit and everyone should go there, but rather than tell you a lot of historical information you can get for yourself from other sources -which I hope my other blogs in this series inspire you to do – I’m going to tell you the thing I remember most about my visit to Mount Vernon. Every parent in the world knows that feeling. They were right next to you, clinging to the seam of your pant or skirt one minute and the next they were gone. I’m sure when my dad first inquired about Susan’s whereabouts I rolled my eyes and said to myself, “It’s always about Susan,” but that was merely my teen-aged angst. Fact is, I absolutely adored that little mite and felt more than a little responsibility towards her. When we couldn’t locate Susan after a few minutes, we began to panic and ask for help. An hour later, my parents were talking with the security staff in low voices and Susan’s inability to swim was discussed. Pretty much everyone from fellow tourists to the Mount Vernon security staff was involved in the search for Susan. From the first moment, I’d wanted to set out on my own to find her, but that was the one thing no one was going to let me do. I was told, in no uncertain terms, that I could help best by not getting lost myself and the best way for me to avoid that was to stay right there. I was more than frustrated. My parents were frantic and the concern of everyone else was obvious. They’d chatted on their walkie talkies. They’d searched the property several times in their golf carts and on foot. They hadn’t found her and I wasn’t buying the Potomac theory. But the grow-ups didn’t know what to suggest next, short of searching the river. God and I have always been close, but at the age of fourteen I still thought of my parents as the first line of inquiry. They provided food, shelter and new packages of notebook paper. In this strange place, Susan had been their responsibility, but they hadn’t been able to produce her since Dad visited the cookhouse. So finally, I contacted God. He gave me the message that she was OK and told me to open my eyes and look for her. That sort of ticked me off, because my eyes were almost raw from the way I’d been peering around trying to locate her. I took a deep breath and began to scan the horizon once again. My eyes ran from the corner of the house across the lawn to a small white foot bridge. Before my brain even registered what I saw, I yelled, “There she is.” My parents glanced toward where I was pointing, but their expressions told me they couldn’t see what I did. I’d had enough. I broke into a run. Then I heard my dad yell, “It is Susan!” My parents were not far behind me as I ran across the immaculate lawn. We all fell to our knees and hugged the tiny redhead we loved so much. Susan was glad to see us, but was a little bemused at the attention. She didn’t realize she had been lost. The couple who had found her hadn’t wanted to upset her by asking a lot of questions and because Susan was with the couple, the security staff didn’t think she was the child they were looking for. All’s well that ends well, but it was pretty dicey there for a while. Traveling is an adventure. Some of the adventures are grand and others you would choose to live without if you could. To escape the hour of trauma for my family, I’d gladly have missed the opportunity to see Mount Vernon, but you never know ahead of time what will be trouble and what will be the most fun you ever had. You’ve got to get out there and risk losing your little sister. In most cases, the missing siblings turn up and you go have lunch somewhere. I don’t remember where we had lunch that day, but you can bet your bottom dollar no one got lost for the rest of the trip. Did you ever lose your sibling at a major tourist attraction? Or were you the one that wandered over the bridge? We’d all like to hear about it. Welcome to number thirteen in this series about presidential destinations for your vacations. The list of presidential destinations I’ve actually visited only has two more names on it, James Munroe’s Ash Lawn Highland and George Washington’s Mount Vernon. I’m sure I’ve had more fun writing this series than anyone will have reading it, but I hope that through reading these blogs you’ve found some presidential destinations you want to visit. Since we went to Monticello last week, let’s go visit Jefferson’s neighbor, just down the hill at Ash Lawn Highland, James Munroe. Presidents Jefferson and Munroe were of similar mind. 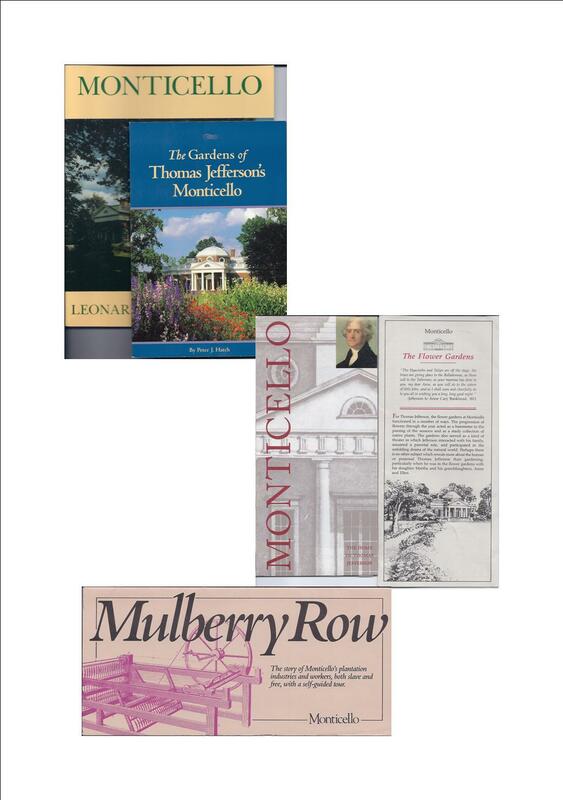 In fact, according this brochure, Jefferson picked out Munroe’s property for him to “create a society to our taste.” Gardeners from Monticello started Munroe’s orchards. The two were very much in one another’s company. His home, Ash Lawn Highland is a pastoral gem. It’s not as grand as Monticello and won’t take long to visit, but you should see it. In fact, when you get in that part of the world there’s a lot to see and none of it is too far away. 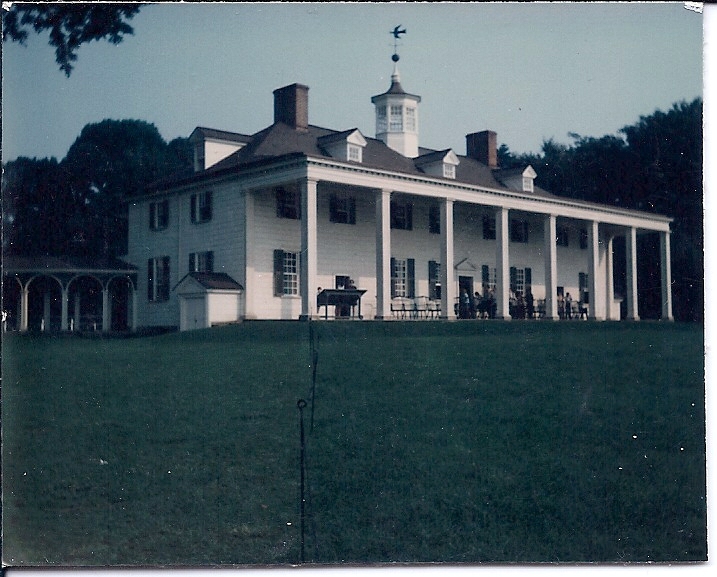 You could visit Monticello and Ash Lawn Highland, see Mount Vernon the next day and then go to Colonial Williamsburg. A drive of just over two hundred miles connects them all. 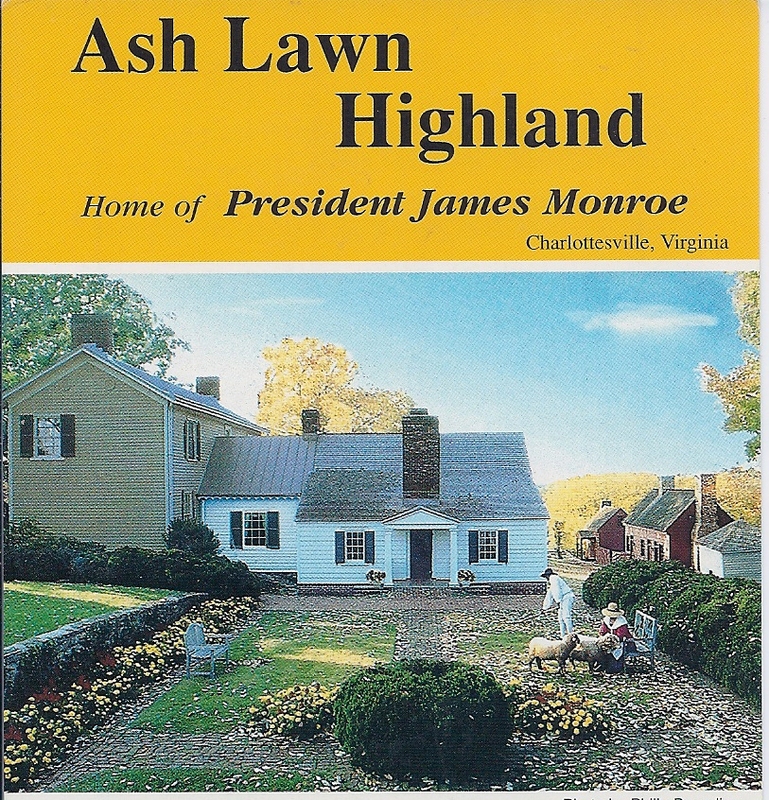 Ash Lawn Highland wasn’t available to the public the first time I saw Monticello in 1969. 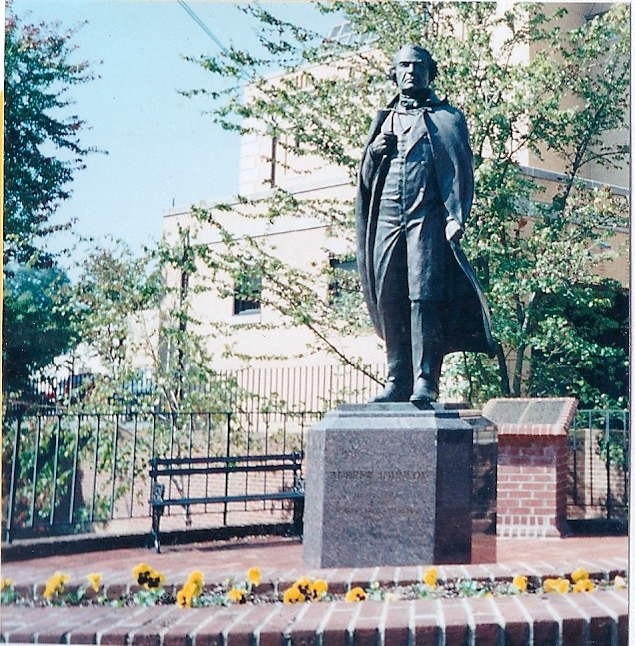 Before his death Munroe, health and financial challenges forced him to sell the property, but on that trip I did visit Lincoln’s Birthplace, Stephen Foster’s Old Kentucky Home, Washington D.C., Jamestown, Colonial Williamsburg, Mount Vernon, Monticello and Myrtle Beach – all on the same vacation. On returning to the area in the nineties with my husband, Ash Lawn Highland had been bequeathed in 1974 to the College of William and Mary “for the education of the general public.” Along with Monticello and Ash Lawn Highland we enjoyed the scenery along Skyline Drive. I’m trying to think of a way to describe Shenandoah to you without employing any of the over-used superlatives which crowd the usual travel brochure, but it’s difficult. The scenery is beautiful, breath-taking and gorgeous. After a day of driving we were worn out – not because the drive had been difficult, but because the scenery had been so overwhelming. As we pulled into Big Meadows Lodge in Shenandoah National Park my husband saw the most exciting thing he’d seen all day: a doe and her fawn feeding in a clearing by the side of the road completely unfazed by the human population across the street from them. We loved Shenandoah and Skyline Drive. Driving through Virginia you can understand the extreme devotion men like Jefferson, Munroe and Washington had for this nation. Their dreams were big and they were willing to sacrifice their lives for our young nation. Jefferson and Munroe brought us the Louisiana Purchase. Jefferson commissioned Lewis and Clark. These men laid the groundwork for manifest destiny, but they built their homes in Virginia. I’m thinking it was about more than proximity to the White House. What do you think? Welcome to the eleventh installment in a series about travel destinations related to our presidents. We’ve been to the Texas White House, The Western White House, The Summer White House and The Little White House. We’ve visited cemeteries, ranches, libraries, museums and even residence of the Confederate President. 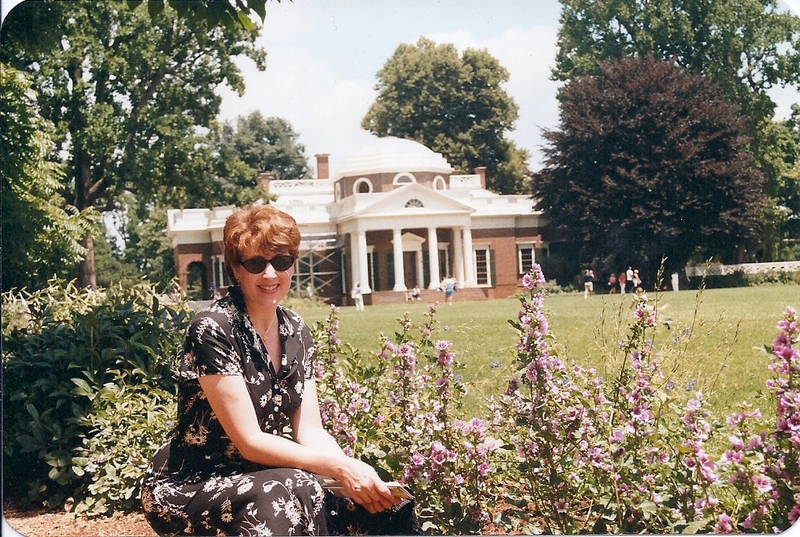 Now we’ll visit one of my favorite homes in the United States and it just so happens to be presidential – that’s Monticello, Thomas Jefferson‘s home. I’ve visited Monticello twice. The first time I was a captive in the back seat of my parents’ car. Their attitude seemed to be, “This is your heritage, gosh darn it, and you better appreciate it.” Let me be honest with you. Given my druthers back then, I might just have traded two weeks of American History in for a day at Disneyland. Though I didn’t realize it at the time, my parents were doing me a great service. In the years after that trip, Thomas Jefferson was not just some guy in a history book. He was the guy who invented some very cool stuff I’d seen when I visited his house. Washington was the guy who had that pretty blue and white china in his dining room (Wedgewood). Lincoln was born in a tiny log cabin and I knew it wasn’t as big as my parents’ living room, because I saw the facsimile they’d built at his birthplace. The dry history on the pages of the textbook assigned to me for a semester became something real. Chances are, if you took your kids on a family vacation, like the one my parents took me on in 1969, you’d get the same sort of heavy sighs and reluctant cooperation that my parents put up with. I urge you to take the kids anyway – and don’t let them watch movies in the back seat. Make them sit up straight, look out the window and talk about what they’re looking at. Quiz them about what they see, what impresses them and what disappoints them. The video games are not going anywhere, but the empty spaces in your kid’s heads are filling up fast. Best to put some stuff up there that you want them to have. 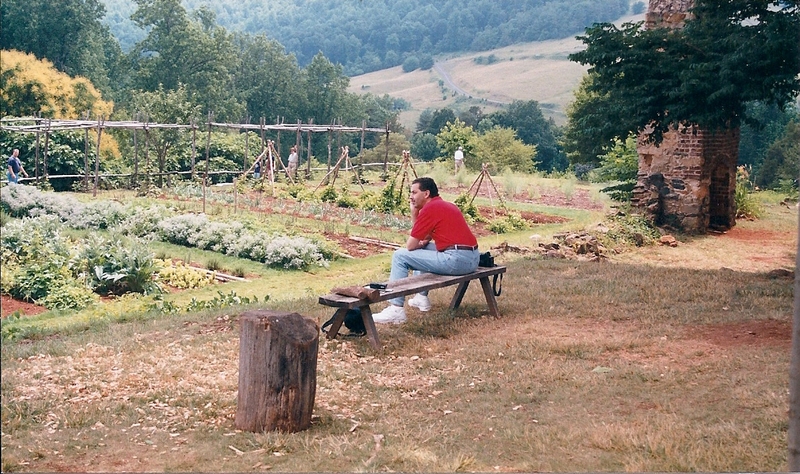 I returned to Monticello in 1999, thirty years after my first visit. The first thing I noticed was that it had shrunk. In my memory the house outstripped anything on Lives of the Rich and Famous. Sure, it has about 11,000 square feet of living area, but back in 1969 I hadn’t been to Europe. Those guys get the whole idea of a country estate. They call them castles. Being dragged to Monticello by your parents is also quite different than traveling with your husband. Bill indulges me, trailing through all the museums I find, but he wouldn’t fuss if I didn’t need to visit so many. Monticello, on the other hand, completely captured his imagination. By occupation, Bill is a very successful options trader. But that doesn’t keep him from an interest in everything from architecture to zoology and all subjects in between. He and old Tom Jefferson would have been fast friends. As we wandered from room to room, Bill was enchanted with the design and execution of the house. He loved Mr. Jefferson’s taste in decor. Mr. Jefferson’s inventions like mechanical doors, great clock and reading lamp stirred Bill’s imagination. Then we walked outside. Bill’s interest in the man multiplied geometrically. In fact, even though that was twelve years ago, merely the mention of Monticello or Thomas Jefferson will send Bill off into the stratosphere. Monticello should be on everyone’s bucket list. Kids should be taken as soon as they are old enough to comprehend the magnitude of what they are seeing and not so late that they will ignore it simply because their parents took them. Then, we should all return as adults to appreciate what we couldn’t comprehend as kids. And no – you can’t take Bill with you unless you take me, too. Welcome to number eleven in a series about travel destinations associated with the Presidents of the United States. Last week, while discussing Jefferson Davis, President of the Confederacy, I mentioned the Post Civil War Restoration and the negative impact it had on the South. Today we’re visiting with Andrew Johnson, Lincoln’s successor, to explore that further. I’m not alone in my opinion that the Restoration of the South by the post-Civil War Congress was too harsh. Andrew Johnson believed the same thing and he was impeached for it. He’s the only president, except Bill Clinton, to go through that dishonor. If the Bushes and the Roosevelts represent the one-per-centers, then Lincoln and Johnson would definitely represent the ninety-nine. We all know about Lincoln’s humble birth, but at least his dad was a land owner. Johnson’s dad was a hotel porter and little Andrew was apprenticed to a tailor. But I doubt Johnson would have signed up for food stamps, even if they were available. His story is that of a entrepreneur of the first degree. Though born in Raleigh, North Carolina, he made his home in Tennessee. In spite of running away from the tailor he was apprenticed to, tailoring remained his trade, until he got into politics. He was a senator when Tennessee seceded from the Union, but Union-loyalist Johnson reported to Congress for duty nonetheless. When the Union regained control of Tennessee, Lincoln named Johnson as military governor of the state. Johnson’s work in that office recommended him to Lincoln as running mate for the second term, because both men thought reconciliation was the right tone to take with the South. Their opponents were out for revenge and repression. In spite of his soft-handed opinion about how to deal with Johnny Reb after the Civil War, Johnson’s personal business philosophy had a lot in common with the Trump. He’s been quoted as having told his son, “There is no use in buying property, unless there is a bargain in it.” I guess Trump’s buddy, Romney, would agree with that, too. Mock tickets to Johnson’s Impeachment were used as tickets to his home by the National Park Service. Visiting the Andrew Johnson Historic Sites in Greeneville, Tennessee is not a day long prospect, like some of the presidential destinations. Bill and I squeezed it in during a Tennessee/North Carolina ramble through the Smoky Mountains and Appalachia. We started in Chattanooga and loved their fresh water aquarium. Bluff View was a delightful little Arts District with a number of bed and breakfast inns, but we stayed at Lookout Lake which we thoroughly enjoyed. We also enjoyed the kitschy Rock City. If you’re in Chattanooga don’t miss The Hunter Museum of American Art which uniquely meshes a contemporary museum with a historic home. Around the corner was the Houston Museum which housed one of the most interesting collection of Decorative Arts that I’ve ever seen. Chattanooga wasn’t all museums and aquariums. Bill spent part of each day hang-gliding. Then we took the Cherohola Skyway through the Cherokee National Forest over to Asheville, where we visited the Biltmore Estate. ( Talk about one-percenters.) Then we hooked around the Appalachians through Johnson City on our way to Pigeon Forge. That’s when we squeezed in Andrew Johnson and the Davy Crockett Tavern, for good measure. We still got into Pigeon Ford early enough to visit The Incredible Christmas Place. We stayed in a little cabin up in the hills, visited Dollywood, Gatlinburg and Smoky Mountain National Park. One of the reasons I can recall all of this information so clearly is because I am such a devoted scrapbooker. I not only save all the photos I take on a trip, but I keep all the memorabilia. 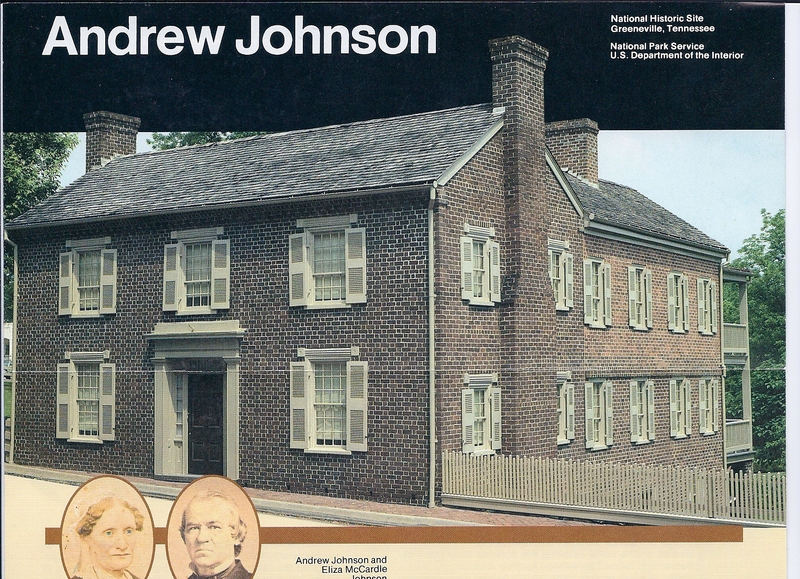 A National Parks Service publication on Andrew Johnson provided his history and his advice to his son. Tickets from the attractions keep me straight on dates. I could even tell you the restaurants I enjoyed and the movie we went to see, because I kept menus and ticket stubs. 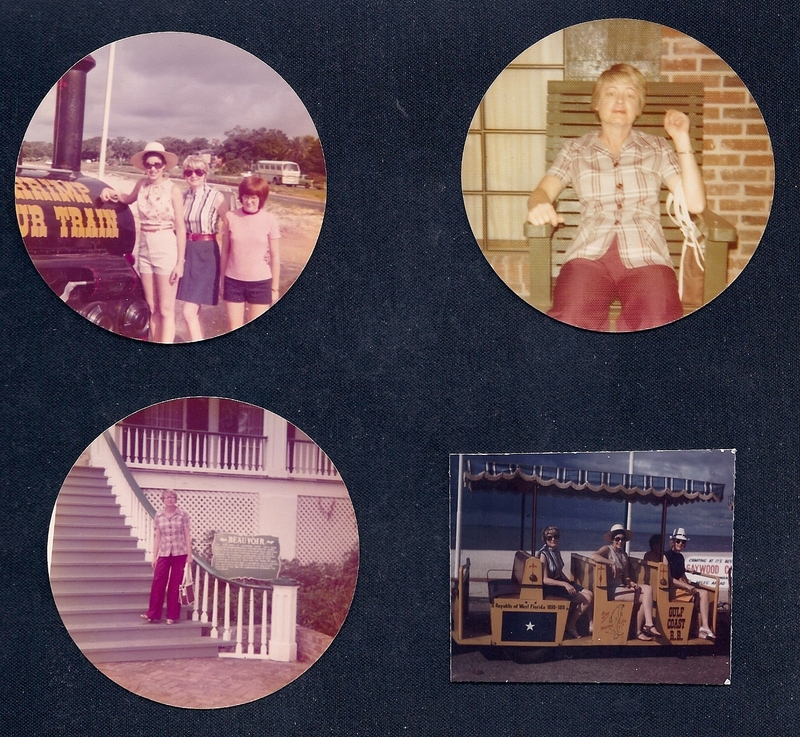 I didn’t even tell you about Chimney Rock Park, The Grove Park Inn or the Louise Mandrell Theater, but I can later, because I’ve kept everything together in my Creative Memories scrapbook. Are you a scrapbooker? Do you look back at your scrapbooks frequently or are they forgotten once they are on the shelf. If you’d like to start scrapbooking a good place to start is a Creative Memories consultant. Mine is Denise Overton. Give her shout if you’d like to get started. Welcome! This is the tenth installment in a series about destinations associated with American presidents. Last week I paid homage to Lincoln, but today I’m going to take a little detour South. Do you know which president lived at Beauvoir? The President of the Confederacy: Jefferson Davis. Before anyone gets their nose bent out of shape, let me tell you that I think slavery was awful. No human being should ever own another and no one should have to suffer the way many slaves did in the South. However, I cannot hate everything that the antebellum South stood for. Beauvoir represents many of the things that are worth remembering. Though the means did not justify the ends, Southern planters created a genteel society among themselves. The genteel aspect encompassed only the interaction between plantation owners and their families, but Southern hospitality is famous for a reason. I grew up in the South. Southern manners, Southern cooking and Southern accents are dear to my heart. These are also alive and well, so they are independent from the travesty of slavery. In the coming weeks we’ll be visiting Mount Vernon and Monticello. Much that is memorable about these landmarks is more closely related to the Southern traditions of Beauvoir than to the White House. History almost as ancient as the Civil War. Scenes from the pre-casino, pre-Katrina, pre-BP spill Biloxi. Biloxi was more of a sleepy little beach town. Beauvoir is situated right on that beach. I remember driving along the coast road and parking next to a comparatively modest house. I’d seen plantations with slave quarters grander than Beauvior. Beauvoir is not exactly an antebellum home. Davis moved there after the Civil War. With his cause defeated, he searched for a place where he could write his memoirs and a defense of his way of life. At first he merely rented a couple of pavilions on the Beauvior estate, but fell in love with the home as he wrote and contracted to purchase it. Climbing the steps at the front of the house and turning toward the sea, you can certainly understand why. Slavery was wrong, but there was a deeper issue that I still support – states rights, and beyond that, the rights of the individual. It is my opinion that the federal government has grown entirely too big for its britches. I’m for sending the czars home and closing down most of the government agencies. I’m not sure exactly how that could be accomplished and I can only imagine my liberal friends gasping in horror, but that’s at the heart of what I believe. Jefferson Davis would have agreed with me. The history of Beauvior after Jefferson Davis’s death tells a story of how we Southerner’s look after one another. Mrs. Davis sold the property to the Sons of Confederate Veterans with the stipulation that as long as there were any Confederate veterans or widows who needed it, they had a home at Beauvior. It served in that capacity until 1957. The American Civil War is a sad chapter of our history, but slavery did need to be eradicated from the land of the free. However, the Restoration was a sad chapter, too. What Lincoln intended for good, John Wilkes Booth’s bullet turned into a horror. The Restoration is an example of government policy run amok. Just as individual freedoms are suffering under an onslaught of government policy now, Beauvior suffered the wind and water of Katrina. If you visited Beauvior today, the architectural restoration is well underway – and more than just restoration. A brand new Jefferson Davis Library and Museum is being built – thank you FEMA/MEMA. Everything should be finished by May 2012, so you might consider a visit this summer. Not only would you see the new and improved facility, but you’d be giving a boost to the Gulf Coast, which is still recovering from the BP Oil Spill. We’ve reached an interesting place in the history of our world. From the day Cain slew Abel and set out in the wider world, men who were uncomfortable with the status quo could embark on settling a new land. They could go beyond the next mountain or the next sea and run things their own way. The earth has no new horizons, so today’s Pilgrims have no where to go. We are finally going to have to learn how to live with one another. I’m not sure how all of that is going to work out, but I hope the world will be able to find a compromise that includes a little Southern hospitality and protects our heritage of the rights of the individual. What do you think?